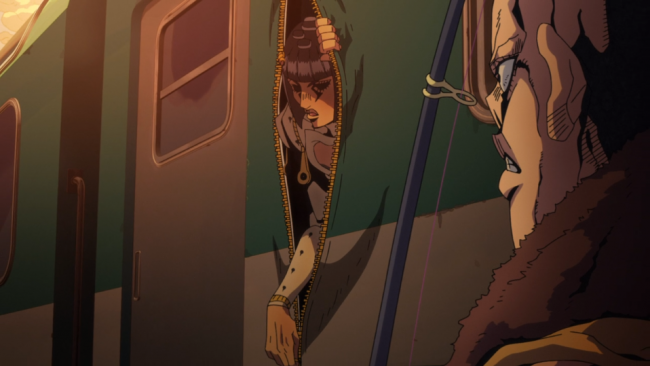 Thanks to the never ending ingenuity of out hero, Bucciarati manages to use Sticky Fingers to unzip his rival’s hand to release the fishing hook and embed it into his own, leaving the blonde assassin to a grizzly, high speed fate. But this wouldn’t be Jojo if the villain didn’t require defeating at least three times, and so Prosciutto manages to somehow wedge his mangled wreck of a body under the train and keep his stand power active, continuing to age everyone on board the train. Thumb head, after being a wailing mess up until this point, has a revelation; he finally understands the true determination of ideals needed to defeat his enemy after realising how Prosciutto continues to fight despite being mere moments from death. Suddenly, he finds himself being drawn in a much more serious style and even throwing a few Jojo poses out there for good measure, becoming a much more dangerous foe than he had initially seemed and forcing me to look up his actual name. 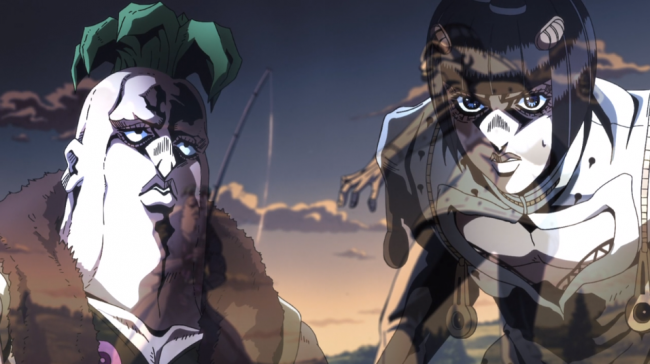 Pesci uses his newfound conviction to plunge the hook of his stand; Beach Boy, into Bucciarati’s body with the intention of ripping his heart from his chest. 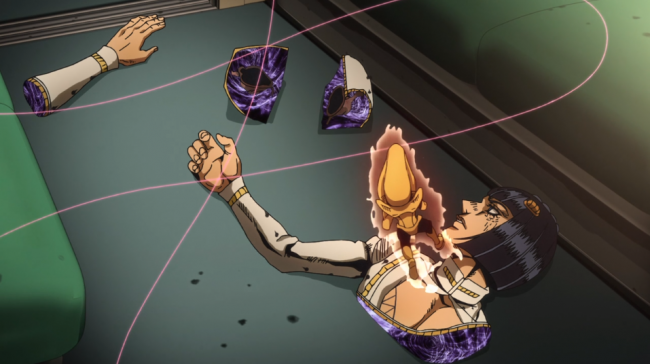 Thank God Bucciarati watched Stardust Crusaders, because he has the idea to unzip his body into pieces, making it more difficult for Beach Boy yo detect him, even splitting his own heart in half to prevent it’s beating from being detected. Jotaro would be impressed. Once Pesci loses Bucciarati, he also manages to lose his cool again and reverts to his old panicky ways. Thus allowing Bucciarati to get the drop on him and twist his head all the way around with his own fishing line… damn. But as I mentioned before, this is Jojo and Pesci is not quite dead yet. In a final act of desperation, he attempts to smash the Turtle in which the rest of the gang are hiding. However, Bucciarati channels Joatro once again and delivers a classic terrible one liner that only works because of how much conviction he puts into delivering it. He fires a punch at Pesci and OraOraOras him into tiny, bloody chunks. I know there has been a lot of violence in this show in the past, but this series has been especially grizzly, between the desiccating bodies being aged into dust, mangled bodies jammed under trains and people getting diced into mulch. You might be catching on that I don’t have a lot to say about Jojo’s Bizarre Adventure from week to week that isn’t just me gushing, because this isn’t an especially deep or complex show. It’s about high action, high style, and Golden Wind delivers both of them in spades. I’m looking forward to next week for the reveal of whatever Trish’s mysterious stand ends up being. 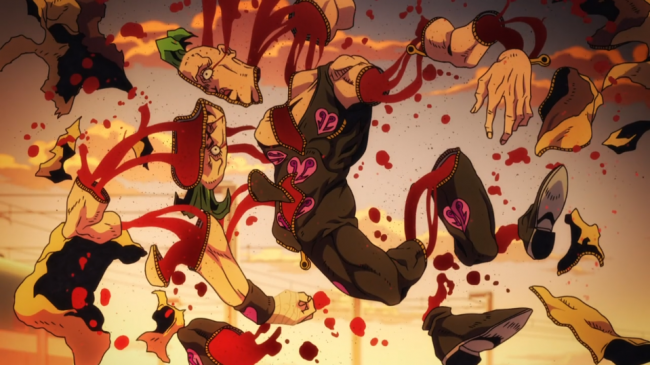 Posted on January 29, 2019 January 29, 2019 by WooderonPosted in Anime, Condensed Reviews:Tagged beach boy, crunchyroll, episode 16, golden experience, Golden Wind, jojo, jojo’s bizarre adventure, pesci, sticky fingers, The Thankful Death Part 2.